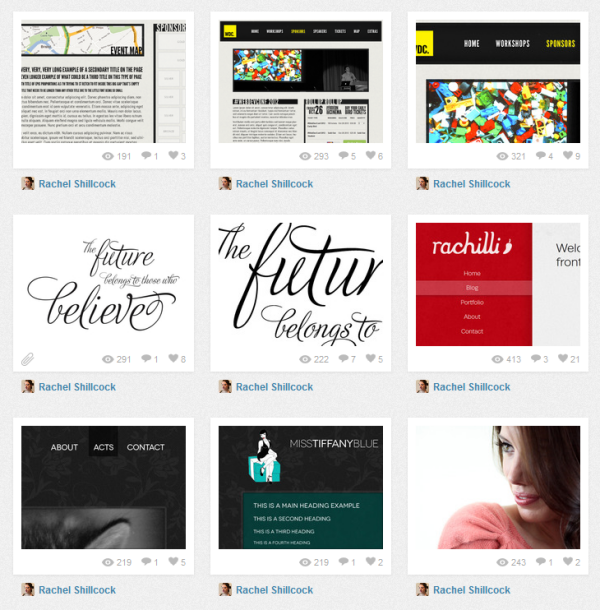 Rachel Shillcock (aka Rachilli) is fast becoming one of the most familiar names in the UK web design scene. We got in touch to see if she would answer a few questions about how she got started, how she uses social media and how she gets inspired. Could you provide a bit of information about yourself and your background? Hey, I’m Rachel but also known by my nickname Rachilli. I started out working in-house at a finance agency a couple of years ago and now currently work full-time at a full-service agency called Fluid Creativity as a front-end developer. Although it isn’t included in my day job, I also love to design. What do you enjoy about working for a design agency over working in-house? I can only go off my experience but working in-house had too many restrictions for me and the work was few and far between. Working in an agency is refreshing as there’s a great variety and there are always new projects to work on around the corner. Having said that, it isn’t to say that working in-house isn’t as satisfying – just that my own experiences so far have been less rewarding than working in agencies. What advice would you give to someone looking at starting a career in web design? I think one of the most important things somebody can do is to make your presence known. Create an online portfolio to display your work – and if you can’t do this yourself as you can’t code there are plenty of tools available to help you. Get on a social network and connect with people in your field. Talk to people, let them know about your work and talk some more. You have been steadily building your presence within the UK web design scene. How can a designer/ agency stand out and get noticed in what is an incredibly competitive industry? Thank you! It goes without saying that to stand out you have to have a good portfolio of work – but have the personality to make it shine and let people know you have that work out there for them to see. To be honest a lot of people assume it’s an easy thing to do – it really isn’t. There’s no simple answer either. The tips I mentioned above for those starting out in our industry apply to those that want to stand out – you need to work hard and learn and absorb as much as you can. One thing I get told often is that I’m one of the nicest people that someone knows – and that’s because I try to take the time to reply to everybody that talks to me on Twitter, I offer advice and I take the time to get to know my followers instead of hiding and ignoring. You have got accounts on all of the major social networks and a lot of the web design related networks. Which do you use the most and which have you found to be most useful to generate work? Twitter is definitely, for me, the best. I love how open it is – I can so easily share what I want to say with so many people and the ability for it to go viral is just brilliant. I’ve talked to and met so many people through Twitter that have helped me not only further my career but also become great friends. Twitter has helped me get my jobs and is also great for quick and easy recommendations from your connections and friends. 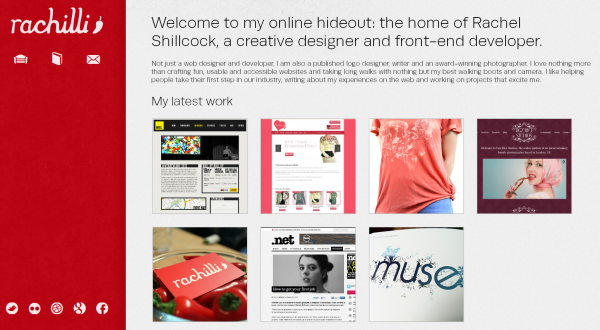 I find that Dribbble is also a great network to be on as it is almost a mini portfolio of your work. You can use this to advertise for work and they also have a really useful feature where you can set yourself as “For hire” – great for people trying to find designers for work! What have you found to be the pros and cons of being so active on Twitter? The pros are that it’s an amazing way of keeping in touch with people and the current events in the industry. You can also grab opportunities quicker if you’re more active. However, I do find it difficult sometimes and find there are actually con’s to being so active. I get a lot of @mentions and due to being so busy it means I sometimes don’t get the time to reply to people that tweet to me during the day. As I said earlier, I try to take the time to reply to everyone that tweets to me but when it can sometimes take a few days to do so some people aren’t happy with that! Overall though I love Twitter and the benefits I’ve had from it far outweigh the bad. Are there any websites where you think ‘I wish I’d done that’? Definitely all of the Nike websites recently! Their “Better World” (link: https://www.nikebetterworld.com/product) and “Air Jordan” (link: https://www.nike.com/jumpman23/aj2012/) campaign websites are absolutely mind-blowing. 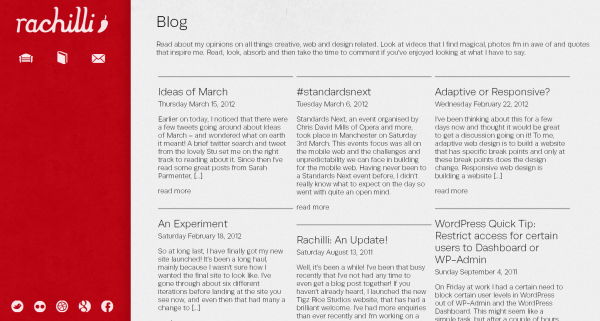 The websites look so complex but really they are quite simple concepts – but their execution is absolutely stunning. Where do you go for inspiration when you hit a creative brick wall? I think the most important thing when you lose your creativity is to step away. Step away from the computer and do something – anything! – that takes you out of that technical mindset. Whether that’s taking a walk, going to the gym or just reading a book you need to take a break from as many things technical as you can. I love taking in things around me and taking what inspiration from what I can. Look at the way that the sun peeks from behind trees on a bright day, the way that weeds worm their way through the cracks in the pavement and even the sounds you hear early in a morning when the birds start singing. Take inspiration from everything around you, soak it up and see how you can then translate this back into your work or, at the very least, how you can use what you’ve absorbed to inspire you to smash through that creative brick wall. Which web design related websites do you read regularly that you’d recommend we check out? I have far too many! My absolute must-check sites for each day are Smashing Magazine, Web Designer Depot and the Tuts+ websites, more specifically WordPressTuts and NetTuts.